Do you play sports or struggle with teeth grinding? Dr. Sabourin offers oral appliances for each situation. With a custom-made athletic mouthguard, you can protect your teeth while staying active. Meanwhile, with a custom-made nightguard, you can prevent the wear and tear caused by the unconscious teeth grinding associated with bruxism. Bruxism, which is caused by stress, does the most damage during sleep when patients can not consciously stop their teeth from grinding together. Constant grinding will damage the chewing surfaces of teeth and cause problems like frequent headaches. If left untreated it can lead to TMJ dysfunction and loss of teeth. A nightguard will protect your teeth and ease painful symptoms. Athletes who participate in rough contact sports already know how important a mouthguard is. 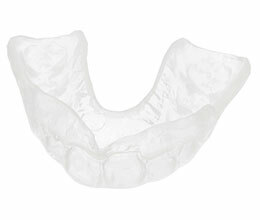 However the truth is, that any athlete can benefit from wearing an athletic mouthguard. A generic mouthguard from a sporting goods store will offer some help, but a custom-made mouthguard from Dr. Sabourin will offer more comprehensive protection for your teeth. We are ready to schedule your treatment for a removable guard with Dr. Sabourin! Call us today so that we may coordinate this appointment! We are honored to serve discriminating patients from across San Diego, La Jolla, Del Mar, Rancho Santa Fe, Solana Beach, Carlsbad, Poway, Encinitas, East County, across the country and around the world.